Liquidware Labs Profile Unity version 6 coming up! Just had a conference call with Liquidware labs about their upcoming release of LWL Profile Unity version 6. We’ve had the calls regularly for they want to update us so that we understand the features and can value them in our UEM Smackdown. 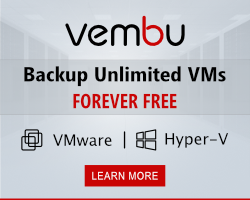 In this short blog I will show you the new features they have brought to our attention, these features will be reviewed for the UEM smackdown. Microsoft announced that it will include a start menu in future versions of Windows, for current versions they offer you nothing. LWL Profile Unity 6 will offer a start menu just like you remember it, administrators can specify if the style is Windows XP or Windows 7. 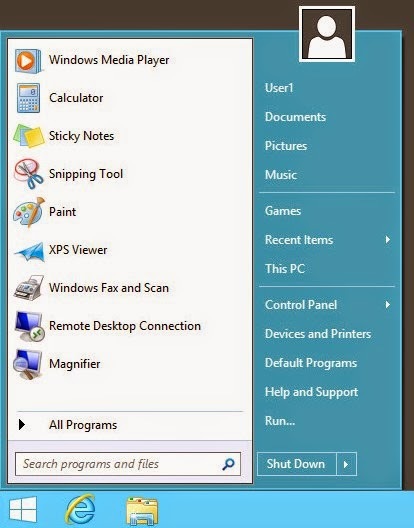 This startmenu will help the adoption of Windows 8 in environments. In version 6 it’s possible to create a filter to deny a user to run any application (executable) except the one that you allow them to. This is of course done per user (otherwise it wouldn’t be a UEM solution) but also keeps in mind the path of the executable. There is no replacing the file with a substitute with the same name, that part is covered they assured me. The other way around is to allow any application to be run except the one that you deny them access to. In the system tray a popup is displayed showing the user that the application is blocked. With version 6 of LWL Profile Unity it will be possible to add elevated rights applications for users. This will allow a user to start or install an application with elevated rights and use any other application with normal user rights. Applications or processes started from the elevated application won’t be granted the same elevated rights, they will start in the default settings. This works with any application is a virtual but also in a physical environment. Several trigger points have been added to Profile Unity to enhance the ability to work context aware. With the trigger points added you can control when profile settings are being saved or when a printer or resource is being made available. 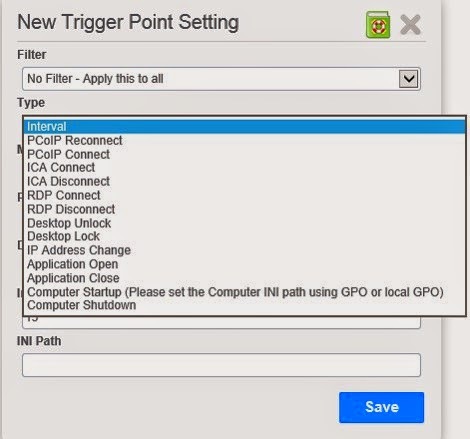 In the screenshot below you see that there are trigger points for PCoIP, ICA, RDP and several others. Customers running Internet Explorer 10 or 11 on Windows 2008R2 are experiencing issues with saving cookies etc. Microsoft changed the way cookies are saved and it’s causing issue for the webcache file holding the cookies is the last file released when logging off. The file is never saved to a central location for that process is finished before you can. Profile Unity has the option to run a script after logoff that will allow you to release the file earlier and make it possible to save it for the user. This is a very wanted solution for it prevents us from going to Windows 2012 and IE11 or go back to IE9, both unwanted solution. I hope this blog shows you what to expect in version 6 of Liquidware Labs Profile Unity 6, I think the additions bring value to Profile Unity. The features will be published on their website soon and soon after I guess the product will be live. Keep your eye open for version 6, your customers might just need a feature they added.